Things have to change sometimes, for example, I had to change the day that I do my regular recipe blog. I thought that it would be better on a Monday, instead of a Sunday. This is what I have to worry about on the weekends! Baby, love, spending time together, and selfies. 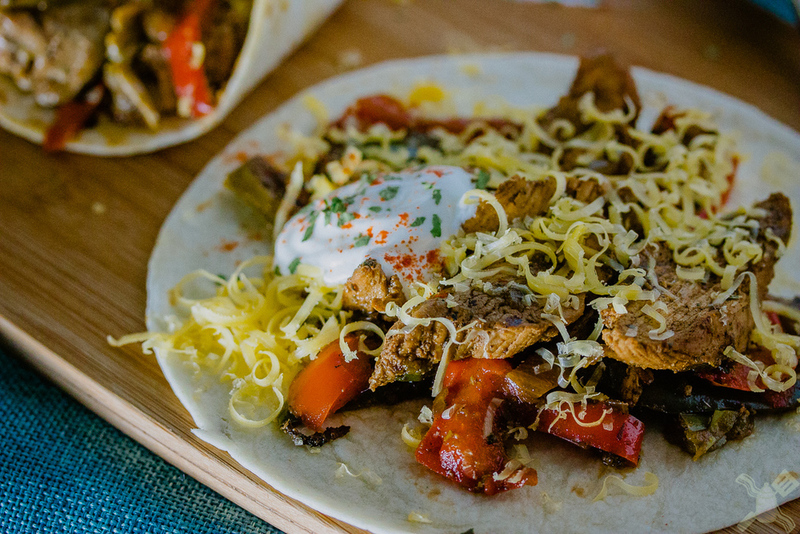 I have a great fajita recipe for you today. Being from Texas, I love Mexican food. I learned to cook a lot of the meals when I was working for this little restaurant called Castillo’s while I was in grad school. Fajitas was one of my favorite things to make, this recipe has taken a lot of tries. Happy belated Mother’s Day! I woke up to a beautiful card and flowers from my boys. I love them so much. They took me to brunch at our usual spot, Braedon ate more than both of us combined! He is such a big boy! I can’t believe how fast he is growing up right now. It really is terrifying. Mother's Day brunch with my love! Saturday we went to my friend’s baby’s birthday party! 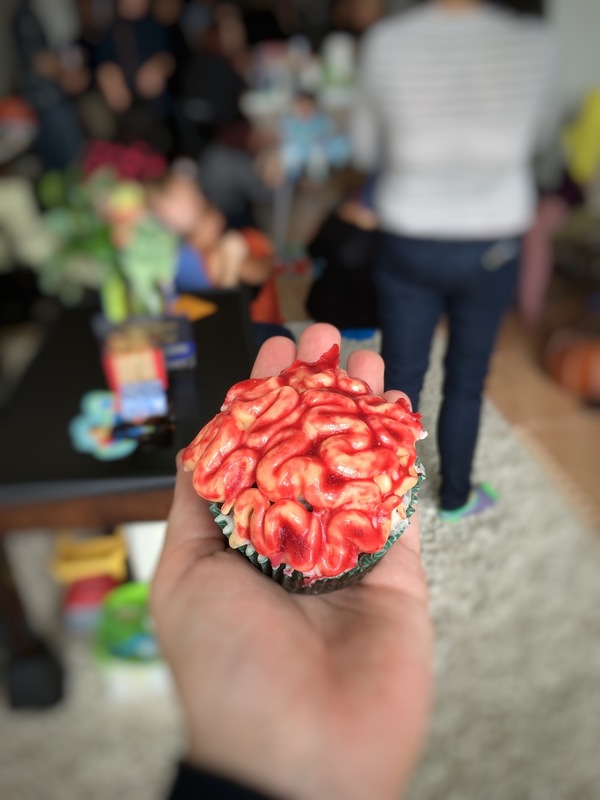 I made the cake and cupcakes, they were zombie brains. They actually tasted fantastic, I was so scared that the flavors wouldn’t go well together when I was making them, but they were a hit. Red Velvet Cupcakes with raspberry puree, perfect BRAINS! I didn’t take any good pictures of them, but I’m hoping that Chloe or her photographer did. I’m so excited to see how they turned out! Max was so cute eating his brains! 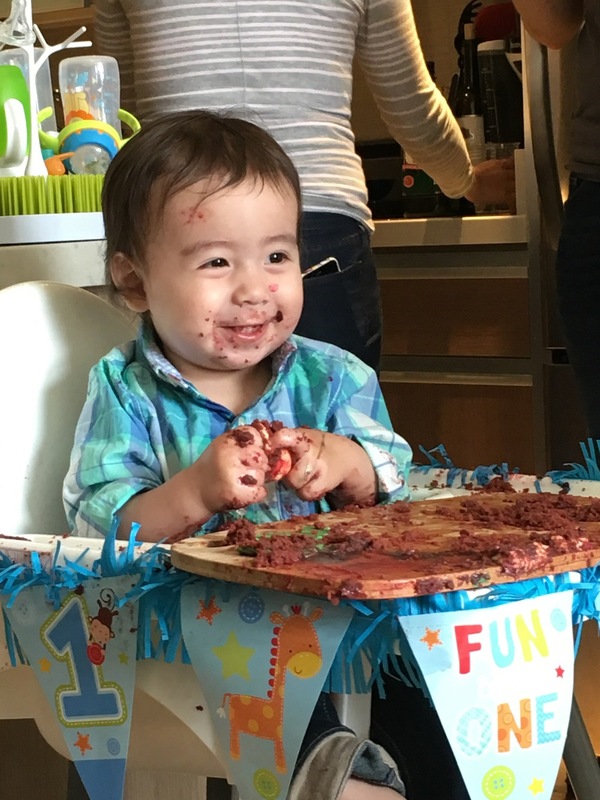 Zombie eating baby, so happy at his conquest! On Mother’s Day we went to Hayes Valley and walked around. It’s the only thing that I really wanted. I wanted to have a relaxing day with my boys. I’m definitely going to have to go back to that little area in San Francisco. There is a park that I want to take Braedon to play at. Unfortunately not until late in the week. I have so much to do this week! My boys playing with sun glasses while we wait for our lunch! We walked around, went into a few shops, a few that I might go back to when I’m not with Gareth! Although, I am not going to pay $100 for a baby jumpsuit, I don’t even pay that much for my own clothes! We stopped and got macarons from Chantal Guillon, I literally walked in and said, “I want one of each.” Gareth laughed at me. I told him that it’s for research, it’s for a Wednesday blog! We also went to this little cafe, he got a San Pallegrino and I got this wonderful caramel mocha latte. We sat outside while Braedon napped and watched people, it was such a perfect day. Caramel Mocha latte and beautiful weather in San Francisco! So, Cinco de Mayo was this week! It’s a fantastic Mexican holiday celebrating an amazing victory over France. I decided to make chicken fajitas for dinner. They may have been the best fajitas that I have ever eaten or made. So I decided that’s what the blog would feature today. I mean, Mexican food is ALWAYS, the best choice. And fajitas ALWAYS makes life better. Unfortunately I didn’t have any left overs, between Braedon and Gareth every part of the fajita got torn apart. My boys know how to eat! Now on to the recipe! Chicken Fajitas for Cinco De Mayo! Place in tortillas, garnish with cheese, sour cream, or whatever else you want on it! Not only is it delicious, these chicken fajitas are quick to make and so flavorful that anyone in your family will eat them! Wednesday, I'm doing a great blog on this chocolate shop called Socola! I am super excited and not only because I ate all kinds of fantastic chocolate, but also because they have Four Barrel Coffee! Looking for other ideas for dinner this week? How about this shrimp alfredo? My mom made it, and she's well, she's no cook, and loved it! Join all of the people who love me by following me on twitter and instagram! And my snapchat is the place to be, add me| whatzername. If you know anyone who does awesome custom barware, please give me a link. I'm needing some new props for MomNoms After Dark!